As an alternative to the likes of banner advertising and in-text adverting, pay per click advertising wipes the floor of the market with what it offers to advertisers. It’s fast, easy to use and cost efficient. 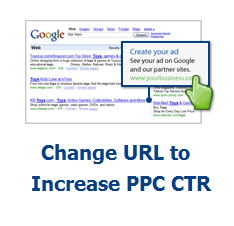 What more, PPC is one of few advertising forms on the internet that will adapt to your campaign’s objectives. If you want fast instant traffic, PPC can provide this. If you want long term sustainable traffic, PPC can do this for you too. It is totally flexible to the advertiser. Whatever objectives you have in PPC, a common problem with campaigns is their CTR. Having a strong CTR means you have the ability to change your campaign’s performance to cope with demands. For this reason, here are some ways you can increase your PPC advert’s click through rate to help maximize your campaign’s performance. Saying this, some PPC campaigns are introducing other elements into PPC adverts such as Google +1 buttons and other links which Nike have done with their PPC text advert. However, the main three elements are listed above. This means there are three areas you can look at to improve your advert’s CTR. Within this article, we will look at customizing the URL. Web user sees a snappy headline and becomes interested in it. S/he then looks to read the description to gain more information from the heading. After reading the description s/he will look at the URL to gain an idea of what type of website it is about. S/he will then decide whether they are going to click on the advert or not. The domain extension will tell web users what type of website your website is. ‘.gov and .mil’ is governement, ‘.edu’ is educational, non-profitable organistations have ‘.org’ with there begin country codes too such as ‘.us’, ‘.uk’ ‘.de’ etc. This provides the tip that if you are targeting your campaign at a specific country, make sure the domain extension is that of the country. E.g. if you are targeting England, use ‘.co.uk’. The fewer characters used in the main body of the URL illustrates to the web user that the website has a high quality URL. Fewer characters means it is easier to remember and better for gaining higher page ranks etc. From this, try to make the body of the URL as short as possible while still making sense. Make sure the body of the URL makes clear what your website or campaign is about. However, there is a balance between making clear what your campaign is about and making it obvious that this URL is made up. For example, if you are selling iPads, a URL of ‘www.buyiPads.com’ is more believable than ‘www.clickheretobuyiPads.com’. There is also the easy option and keep the URL of your text advert exactly the same as your actual landing page’s URL. However, you may find that including the above tips will help to improve your advert.